The toughest of the organized training rides occur in March. 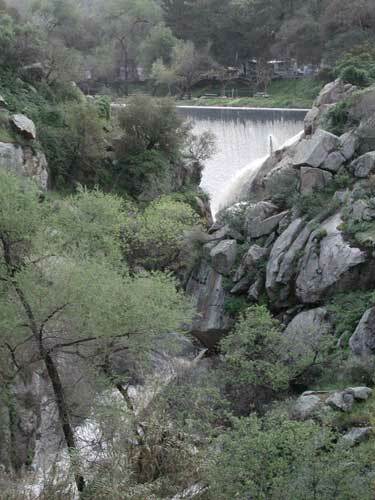 Done are the scenic rides through canyons or around the bay. 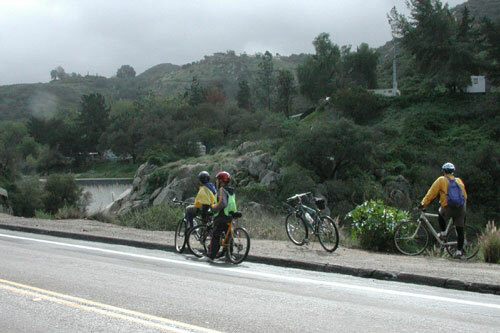 Every Saturday and Sunday in March are the Escondido Hill Climbs: 16 miles and one major hill out, and 16 miles and two major hills back. (Brain Teaser: How is that possible?) 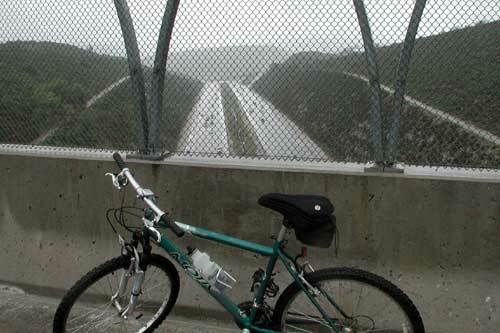 The ride parallels Interstate 15 from Escondido to the San Luis Rey River valley on old highway 395. Now its a frontage road, but it used to be the only road before Interstate 15 was built circa 1980. 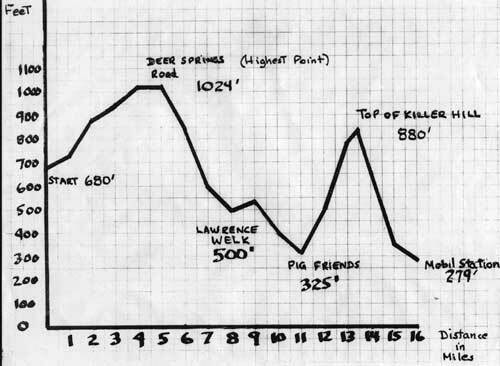 They say this ride is tougher than any single day on the Ride Across California. 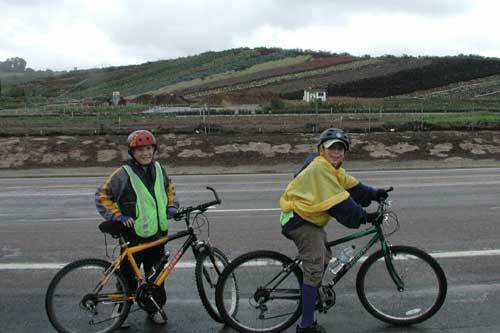 Kids must complete the ride twice to qualify for the week long Ride Across California. Because of Basketball (Brad playing and Keith score keeping) and Baseball (Brad playing and Keith coaching) and Church commitments (Brad acolyting and working in the nursery and Keith teaching Sunday school and deaconing), we found it very hard to find time to squeeze in the rides. Keith could have sent Brad with another family, but there was an unspoken agreement between all family members that Keith should go with Brad the first time he attempted this most grueling test so far. Two weekends went by and we began to get desperate. The third Sunday was a definite go, as Keith got people to fill his commitments at Church. Then it rained. We drove to the staging area through intermittent showers. We arrived to find no one there, and wondered if we were the only ones dumb enough to assume it was still on. 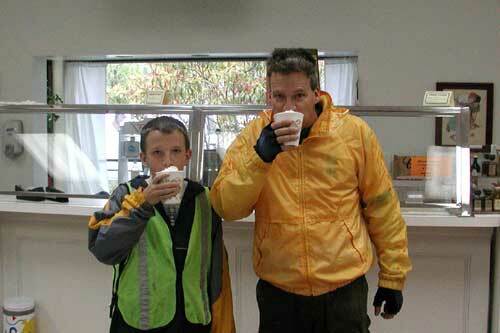 Only Brad’s friend Tony and his dad eventually showed up, along with Brad’s teacher and Ride sponsor, Mr. Bueker. We waited in the cars hoping the light shower would either stop or come down in torrents to send us home. 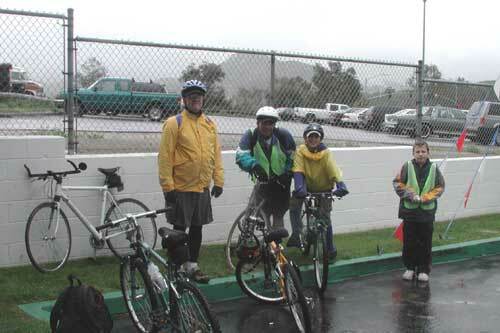 After 20 minutes of continued drizzle, Mr. Bueker said it was time to ride or go home. Brad and I declared we had no choice but had to ride in order for Brad to get his two in. So off the five of us went. I couldn't quite tell whether Mr. Bueker was delighted by such enthusiasm or disappointed he had to go at all. The rain came and went and came again. It was never so hard as to be completely miserable, but I could sure imagine a more pleasant set of circumstances. 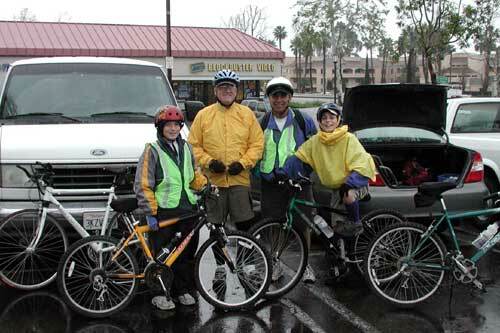 I made mental notes about what rain gear Brad and I lacked that I should pick up before the Ride Across California. After a mere 8 miles and at the end of a long down hill, we stopped at the Welk Resort for our first break. Keith thought stopping was a big mistake; he would have much rather taken his medicine and gotten the unpleasant ride over with as quickly as possible. But here I must, in retrospect, bow to the superior kid-knowledge of Mr. Bueker, fifth grade teacher of untold years and veteran organizer of twelve previous Rides Across California: the kids were not out for the thrill of the bike ride, they were out for fun, and if we didn't generate some fun soon, it was going to get soaked right out of us. So we stopped for half an hour and enjoyed hot chocolate and conversation with the thoroughly under utilized proprietor of the soda fountain. We timed it perfectly to avoid a good 20 minute stretch of partly sunny dry weather. 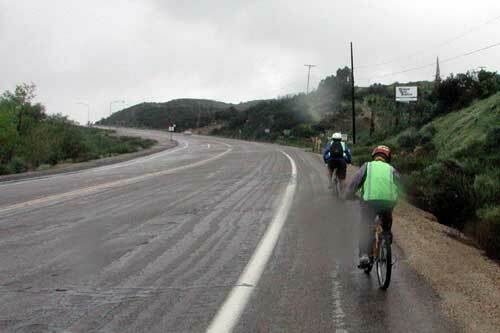 No sooner were we back on our bikes than the rain started up again. The sky cried in pathetic fallacy as we struggled up the long, steep hill, nick named "cardiac hill" in Bike Club folklore. When we reached the top, the group took a short side tip over to the bridge across the Interstate at Keith's suggestion. The spectacular bridge had always interested him, and he always thought about trying to drive to it when he drove under it on I-15. Never did he dream he would ride his bike to it and ride across it. Then it was a quick ride down the next hill to our lunch stop and turn around point, the Mobil station. 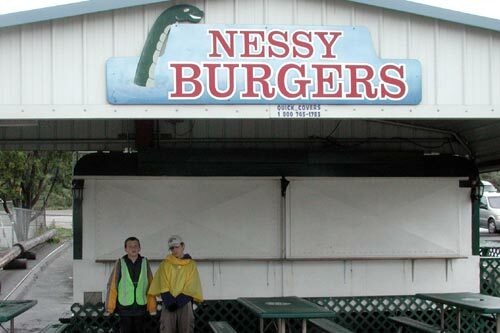 On Saturday's it's the adjacent hamburger-trailer-stand called "Nessy Burgers." On Sunday, though, the Nessy's is closed and "lunch" is at the tiny, crowded, and cramped Mobil Qwik Mart. Not exactly a scintillating reward after working so hard for the last couple hours. After consuming some beef jerky for lunch and giving lots of gas patrons directions to the nearby Indian casino, we loaded up and began to retrace our tracks. Brad, I must say, really displayed his learned lessons from our training rides. He started both of the last two hills way in the back of the group. And he finished both hills first, simply because he was slow and steady and did not stop to rest until reaching the top. It's remarkable how going slow on bike rewards the careful observer with a completely different ride on a return trip over the same course but in a different direction (and different side of the road). On the way back we stopped at a waterfall and a house on the west side of the road that I had completely missed when we were riding on the east side of the road. The weather did finally break for us halfway back home, with the rain stopping and the sun occasionally peeking through patchy clouds. But the day wasn't done tormenting us yet: the partial sunshine was accompanied by a new nemesis: a head wind. As we rode the last down hill back to our cars, I thought how lucky we were. Lucky to have survived, lucky to have had no accidents on the slick roads, lucky to have been such a small close knit group. But lucky most of all to have the opportunity to make the ride in (far) less than ideal conditions, and to accomplish the challenge. 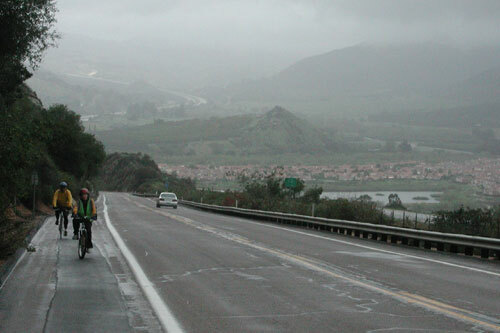 It made us far stronger for whatever hardships might come our way during the actual ride across California. Brad remarked several times near the end of the ride and afterwards that the ride wasn't nearly as difficult as he imagined it would be. Every time he said that, Keith heard, "Thanks, Dad, for getting me out on all those training rides."